A group of hooligans have caused complete commotion in Oyo State after storming the area to unleash mayhem on residents. 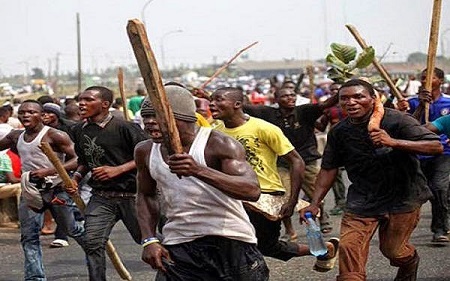 Some hooligans, popularly called One million boys, have stormed Oyo State to cause havoc. The group on Tuesday invaded the Kudeti area of Ibadan, to attack the youths in the area. According to Punch Metro, they even went ahead to cut off the hand of one of their victims. A resident of the area, who spoke on condition of anonymity, revealed that the hooligans invaded the area because youths in the communities refused to join the group after several attempts to woo them. “More than 300 One million boys stormed the community with weapons, including guns. They shot at youths in the area. They also attacked them with knives and cutlasses. A victim, Sikiru Muftau, also known as Alase, had the lower part of one of his hands severed completely and they made away with the part. “There was commotion in the communities and people fled the area for fear of further attack. I am also moving out because the police refused to come throughout the attack that lasted for more than five hours,” he said. It was learned that relatives of the victim had been calling on the suspected hooligans to return the severed part of the hand. Another resident, however, said Muftau was a factional leader of the group, adding that the fight was between two rival factions. When contacted, the Oyo State Police Public Relations Officer, Adekunle Ajisebutu, said the command was aware of the incident, adding that the severed hand had been returned. “We are aware of the visit of some hooligans to the community and we are investigating the attack. “I have the information that the hand has been returned. The truth is that no official complaint was lodged at any of the command’s police stations until on Wednesday morning. We have yet to apprehend any of the attackers. However, investigation is ongoing,” he said.